Why use Atom Prairie Grass? Prairie Grass is a member of the Bromus species. There are three major brome species in commercial use; Prairie Grass, Pasture Brome, and Grazing Brome. Bromes are more heat tolerant than ryegrasses. Bromes maintain their high-quality status even when in a reproductive state. 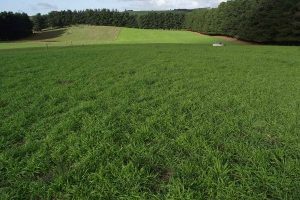 Bromes have the potential to persist for longer than ryegrass in subtropical pastures, this is of most benefit to the northern states of Australia. Tonic Plantain, Choice Chicory, White and Red Clover, Lucerne, Annual Legumes. Sowing this combination of species will create a balanced high-performance pasture. Prairie Grass is best established as the sole grass in a mix to gain the maximum benefit from establishment and grazing utilisation. Recommended Sow Rate: 30 - 55 kgs/ha. From sowing, graze when the plant has 4 tillers. In mid-winter, the grazing interval may be 30-35 days, and in early spring it may be shortened to 20-25 days due to the natural spring flush. Longer grazing intervals during late spring and summer are essential for prairie grass persistence and reseeding. This allows the lower tillers to senesce and form a mat on the soil surface. The idea of a mat is to reduce the soil surface temperatures in summer and to prevent summer grasses and weeds establishing. This mat breaks down towards the end of summer and allows the new prairie grass seedlings to germinate and establish.